If you are someone who has always been partial to hanging baskets, yet you like succulents, you might be wondering “What are my choices?”. There are plenty of succulent plants that hang down that are perfect for hanging baskets. Some succulents are best being allowed to grow tall or straight out of a pot. However, there are many types of unusual succulents that enjoy growing in a hanging pot so they can stream down as each new piece starts. 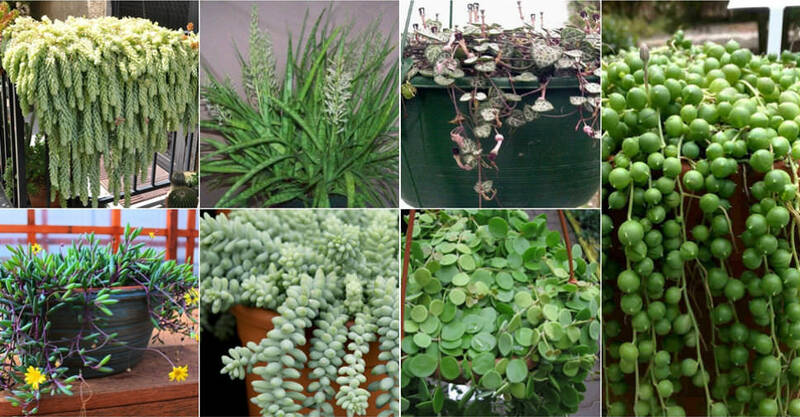 Here are some popular hanging succulent plants. One of the prettiest Sedums, this is one of those unusual succulents that grows in the pot and has pendant stems that tend to cascade down over the edges of the basket. The foliage is short and very light green. Hanging succulent plants are usually easy to propagate, and the Donkey’s Tail is no exception. This particular hanging succulent starts out as an upright plant that ends up becoming one of those hanging succulent plants with bright green foliage. The foliage is shaped like a lance and can be up to 1.5 feet (45 cm) in length. It also flowers with little pinkish-white blooms. It seems similar to S. morganianum, which is native to Mexico and forms long cascading stems of glaucous, blue-green leaves, there has been conjecture that perhaps ‘burrito’ is a natural S. morganianum hybrid. Gorgeous succulent which forms tails and trails down the pot as it grows. Excellent for hanging basket culture, or in brightly lit atriums or patios with filtered light. This is one of the creeping hanging succulent plants. It is actually a member of the Daisy family. It has trailing stems that reach many feet in length. This is an excellent example of plants that hang down because it trails nicely. It has yellow blooms that require sunshine in order to open up. Sometimes called the Rosary Vine, the stems are long and pendulous and this is a great choice of hanging succulents if you are looking for plants that hang down beautifully. It has leaves shaped like hearts and while the upper surface of the leave is a pretty blue green with some silver, underneath the leaves you will find a beautiful purplish gray. Easily propagated, these types of hanging succulent are truly a great addition to any of your hanging plants. This easy-care, succulent plant resembles a beaded necklace with its fleshy green, pea-like foliage and looks great in hanging baskets. This trailing succulent plant has interesting foliage that screams for attention. It consists of round, gray-green leaves which are flat and reminiscent of little coins (about nickel size) hanging from a string. There are many different types of hanging succulents, and they are pretty easy to care for, because hanging succulent plants do not require watering as often as other hanging plants. In answer to “What are my choices”, you can see there are plenty of choices to be had if you want to grow hanging succulents around your home and garden.